What Board Skills and Experience do you need? Posted byLance Wiggs	 January 22, 2014 3 Comments on What Board Skills and Experience do you need? 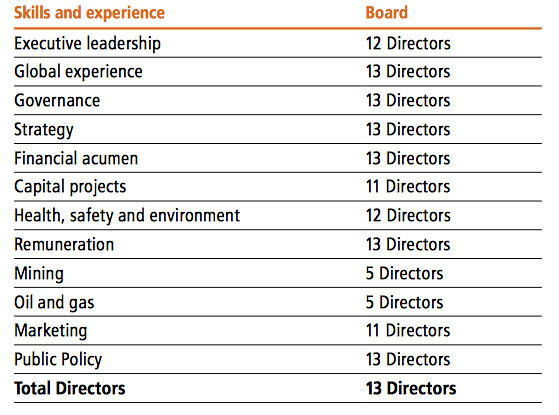 BHP Billiton created this deceptively simple chart on the skills and experience of their Board of Directors in their excellent 2013 Summary Review. I challenge all boards to do the same. The categories in the table are interesting as they show what BHP Billiton sees as important. They want deep experience across the table in the business itself (Mining, Oil & Gas, Capital Projects, Marketing and Global Experience), with working with major stakeholders (Public Policy), as well as all of the things that companies do (Health Safety and Environment, Strategy, Executive Leadership, Finance, Renumeration). But most importantly experience in “Governance” is only one of the 12 items on the list, and arguably for me the least important, as it is not possible to successfully govern a business that you are not equipped to understand. I’d like to see on the table two more lines. The first would be something about experience in investment or portfolio management at a global macro level (beyond Financial Acumen). BHP Billiton is a hybrid of an operating company running huge mines and plants, a marketing company dealing in commodities and an investment company that manages long term positions in commodities. The major decisions about which areas to invest in or divest drive long term profitability, and need a strong collective grasp of the global macroeconomic situation. The director bios does show some evidence for this experience. But I’d also like to see a little experience in IT on the list, as even a mining giant relies heavily on IT, and they can and do spend billions on SAP implementations. Those major IT projects can have a disastrous impacts if done poorly, and the board should be able to understand how they work, or not. The director bios show no evidence of this experience. But I’m nitpicking – BHP Billiton have done an excellent job here, and it’s what every board should do. However most boards will struggle to show the high numbers of directors that have close to the complete set of key skills and experiences required, as that BHP Billiton’s have. And while most companies are not delivering US$65 billion in revenue and US$11 billion in EBIT, they do need to get close enough. At the very least every CEO/management team should write down the areas that they believe the board should be skilled in, and work with the board to plugs the gaps. But even the discussion about which categories to include in the checklist will be difficult for many firms, and the evidence today is that many boards of large companies in New Zealand have huge gaps, especially with IT and the internet implications, but we also see people with little relevant experience in any areas of the business that they are governing. Rather than give examples, instead here is my quick take on the sorts of skills I’d want to see in boards for three types of companies. Let me know what you think – what’s missing? What don’t they need? A very early stage company needs a small board, but one that is very strong on strategy and getting things done with the founders. As they grow they need to understand the end users and customers, and always they need to be comfortable and experienced with the pace, change and techniques of start-ups. They should also collectively bring strong connections with funders and other industry players, and patience and sage advice for the CEO and other founders. While it’s tempting to choose the directors from CEOs of companies that have succeeded, make sure they earned lessons, and consider also founders who have failed if they understand the lessons learned. This is likely to be a younger board as the number of seasoned directors that truly understand internet businesses and can operate at speed are distressingly few. I would also, especially after reading the Twitter book and some recent conversations, be very active in churning the board, quickly swapping out members who don’t agree with the core strategy or are essentially negative for the company, and moving on people whose contributions relate to stages of growth that are either too early or too mature to be required at a particular time. High growth companies change quickly, and there is no shame in passing the baton to another group, or waiting until the company grows up. I’ve deliberately written this draft list without looking at the board members of any particular company, so treat it as simply a provocation as you make your own list. Internet NZ is a not for profit incorporated society, and councillors are elected, not selected. (I am one). It’s tricky as InternetNZ has both commercial and non-commercial goals, with the first enabling the second. It needs to be run professionally, and aims to research, engage stakeholders and spread the world on the open and uncapturable Internet for all. The membership base is in transition from being dominated by the people who got the Internet going in NZ to those who are passionate about issues like privacy, copyright and accessibility. 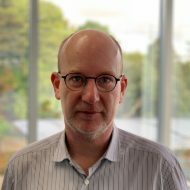 Internet NZ derives income from its mandate to administer the .NZ domain space, has some of those funds invested and has very conservative policy around looking after payments in advance. That’s a long term focus, which will build capacity of the organisation over time. The Council is responsible for two subsidiaries, and has delegated much of this responsibility to their professional boards. Without recourse to the Councillor role description, again here is my first impression of what we would desire around the table. Remember this is my own take and even I won’t stand behind it, as I’d want to get a lot more input, but it’s a interesting exercise nonetheless. Surprisingly enough the Council has pretty decent coverage in most these areas at the moment, though the recent resignation of Nat Torkington meant that we lost one tick from most of those categories. The last point, representation from different communities is traditionally a tough one, with council dominated by white males. We now have two women councillors and several strong non-white-male candidates for the bye-election. I’m assuming the company has a stake in Marsden Point refinery, and operates a chain of petroleum dispensing service stations. The business can win or lose on fuel hedging and purchasing decisions, while the retail strategy and execution is also critical, as are IT systems and the internet. But above all this is a safety-first business, as dealing with flammable liquids safety needs to be designed in to everything. I am guessing that Z Energy, who are doing a huge amount well, have most of this covered. Again I didn’t cheat and look. Amusingly enough my own experience covers almost all of the items listed on this page. But that’s also clearly my own experience coming to play, and the board will need a list formulated by several people with dissimilar perspectives. One suggestion is that the CEO firstly drafts it, but then test it with managers and more junior staff before working on it with the Chair or board. Another is for the board to do this themselves. UFB progress at 1.5% – who wants other 98.5%? Looks like endorsements on Linkedin and could be just as pointless. My question is who decides which skills a director has? And would Ego get in the way. It may not be a big deal to not have Mining experience but I bet one BHP director is extremely pissed off that they aren’t considered to have Executive Leadership. : I bet one BHP director is extremely pissed off that they aren’t considered to have Executive Leadership. One person (a Baroness no less) was “only” a Minister in the UK, and most of the others were CEOs of very large corporations, or maybe it’s the person who was “only” a senior investment banker (and a lot else). Their standards are very high. Lance, some of these look like “wish lists” and, in the case of an early stage company board, are unlikely to all be in evidence (given smaller board size). Prioritisation is key. Also have to reflect on skills primarily required within management (eg staff development) and those skills that should be brought in through advisors (eg legal). Stocking a board full of industry knowledge can be counterproductive as some approaches/matters are taken as convention and never challenged. Industry vs non experience on a board should be balanced but with a weighting towards the former. A board with a predominance of ex CEOs has to be carefully chaired as discussions tend to delve in to the detail/operational (especially if they are recently departed or current CEOs). Finally, current thinking is that skills and experience are only one part of the board mix. Stronger decisions come from diversity of thought which is often a by-product of live experience, gender, age etc.